I return to the office rather cold but extremely pleased to have fulfilled some wishes I've had for many many years. 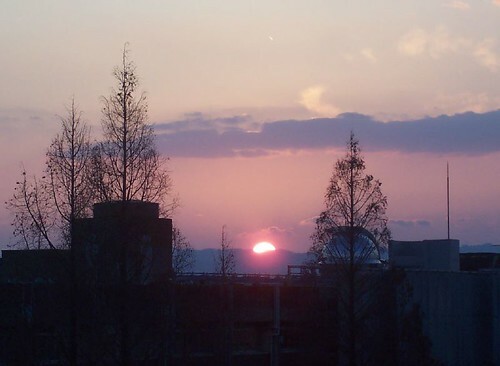 While watching the sunsets from my office I couldn't help noticing that the campus has an observatory tower on top of one of the buildings. With a little research it turned out to be the astronomy and geosciences department. Today after lunch I headed over there and found the appropriate student who uses the telescope to inquire whether I could tag along if they were going to be using it, hoping to see what goes on. I knew this was a little cheeky but couldn't resist and he was very happy to oblige. After a warm spring day the evening had turned rather cold and when we arrived at the building to meet him again it was distinctly chilly, but the sky was clear and the moon, at only a small sliver of light, was not overwhelmingly bright. 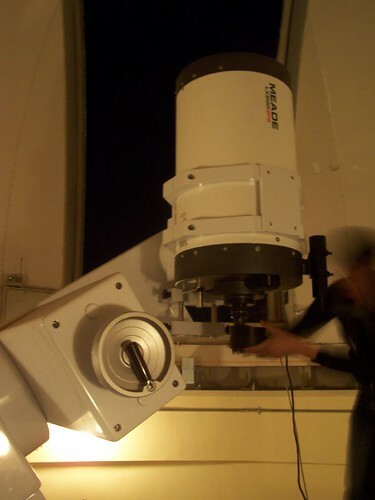 In the observatory tower sits a fine Meade 14" Schmidt-Cassegrain telescope, somewhat putting my 4inch Newtonian, bought after my bar mitzvah, to shame. My telescope saw me through many frosty evenings, though all one could see was a fuzzy Jupiter and Saturn, a solid Venus, a wobbly mars and some fine detail on the moon. The occasional comet that came through was also marginally magnified and stared at for hours. The guy who was kindly showing us the observatory has been at the university almost a decade (from undergrad). He's studying short-period binary star systems and in all that time he's never used the telescope to look at any of the incredible things one can see at in the sky, only to investigate the light emission from the binary systems! I could hardly believe it, but as we went from object to object he gazed in the same wonder that I did, extremely happy to be seeing these stunning sights for the first time. The first object on view was Saturn, which is particularly easy to spot at the moment and the rings and three of the moons were clearly visible. Of course it looks just like it does in the books, but to actually see it for real is quite something. There's a photo on my flickr site, though attempting to put my 3 megapixel camera up to the lense without damaging anything didn't make for a great shot. 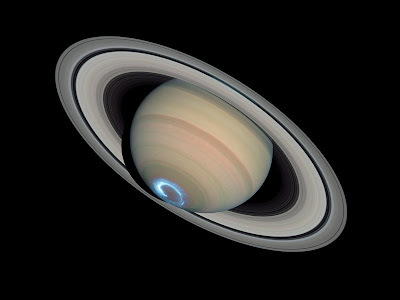 So, courtesy of NASA and STscl is a rather stunning image of Saturn with a polar aurora to boot. While I was in Australia in my gap-year, the highlight of the trip for me almost without a doubt, was spending eight days camping in the outback in the Kimberleys, many hundreds of miles from the nearest settlement and ten times that distance to the closest city. The night sky was truly unbelievable and the images remain with me. On a clear night in the UK you can see stars, of course, usually a few of the planets, though they are easily mistaken for stars, the moon and, on a very clear night if you're lucky, the faint band of the Milky Way and a tiny smudge of Orion's Nebula. In the outback everything was infinitely clearer. The Milky Way was no longer a faint haze but a dazzling streak across the centre of the sky and, what blew me away, were the views of the large and small Magellanic clouds and the Andromeda Galaxy. I never knew that they were visible to the naked eye but with enough time to adjust to the darkness they are all stunning, perspective changing views of the cosmos. 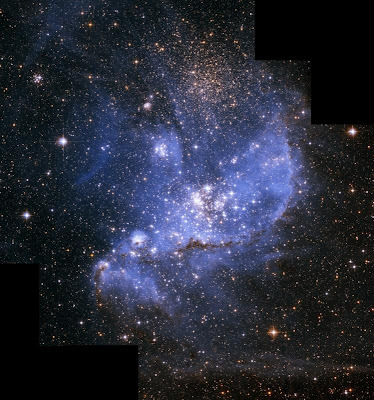 Hubble views of the Large and Small Magellanic clouds. Again courtesy of Nasa and STscl. In the telescope that we were using it was not possible to view Andromeda without using the electronics to take in more of the light than we can with our eyes and the large and small Magellanic clouds are visible only in the Southern hemisphere. 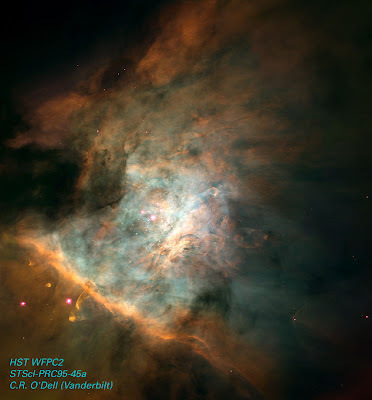 We could however see Orion's Nebula, M42, beautifully and again this is a perspective changing view. 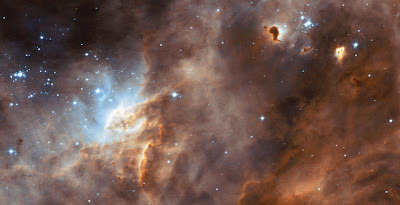 Instead of just seeing planets and stars you are viewing a giant cloud of dust and gas, producing new stars in its heart. The colours are a lot more diffuse than those that you would see in a text book, but the shape is unmistakable and the beauty of it is stunning. Objectively this isn't the case, it's just a bright smudge in the sky, but if you consider what's really going on there it's quite a mind blowing view of a completely new aspect of our universe that I had never before seen. 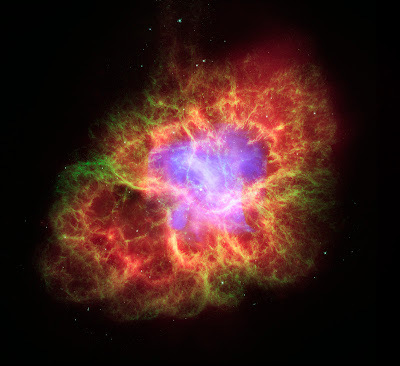 With the electronic eye attached to the telescope and plugged into the computer we had a great view of the crab nebula, an object first seen around 1000 years ago when a star exploded making it visible in the daytime for almost a month. This was recorded in Chinese texts and now what we see is the gas hurtling away from the rapidly rotating neutron star at the centre at somewhere near the speed of light. The pulsar rotates at roughly 30 times a second! I remember learning this when I was a kid and truly not believing such things could be possible, I still find it pretty crazy. The fastest pulsar weighs a little more than the sun, has a diameter of around 16 km and spins at over 700 times a second. The equator is going at roughly a quarter the speed of light. That completely blows my mind! None of the things that I saw were particularly unusual, but I've simply never had a chance to look at them through a half-decent telescope. I hope to again some time, though now my main aim is to view the aurora. Any trips to Northern Europe will be happily accepted (post November). Fantastic blog this time too and just proves that your curiosity is a great tool for enhancing the lives of others who had never thought to look at what is in front of them (10 years!) Just keep giving everyone you meet the chance to see their world with fresh eyes and keep on asking the questions. Don't you dare get to those Auroras before I do! Oh OK then maybe. i've been looking at pictures of the cosmos forever. as a kid, i used to sit on my roof and look at the stars. i'm hoping that i'll soon be able to buy a telescope and see something live. It's a noble aim and a good outcome but I can't claim that the visit was motivated by more than my own curiosity. Indeed, if I can get people to open their eyes to the amazing things around them, be that in sciences or other realms then I'm very happy indeed. 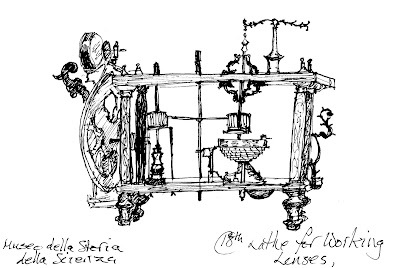 Many many hours spent looking at the stars probably helped to drive me into science. The fact that we had somehow been able to tame these points of light and understand what was going on up there made me want to know more and learn to do some of the investigation myself. If you get a chance to use a good telescope in a decent location then you should jump at the chance. The likelihood is that if someone has a good telescope then they are probably passionate about the subject and consequently will love to talk about it and show you what's out there. Of course this isn't always true but most people in science are in it for the love of understanding and investigation, and not for the money!